EXPIRES 12/2022 OR LATER PepperBlaster II's super hot, super effective one-two punch stops threats at a distance like nothing else can, disabling an attacker for up to 45 minutes. A team in Switzerland engineered this totally new personal safety device to be three times as effective as the most popular spray, because it's not a spray. The ergonomic grip provides a perfect grip for almost any size hand. This game-changing design is disposable and economical. The pepper solution itself is the most powerfully concentrated version on the market. Because it's not pressurized like an aerosol spray, there's no way it can lose pressure over time. 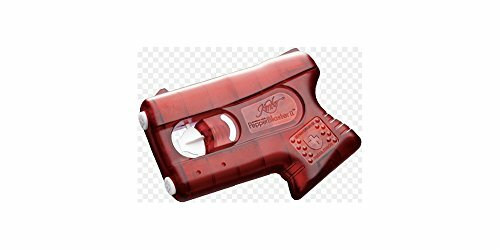 PepperBlaster II eliminates the well-known shortcomings of old-school aerosol pepper sprays. It also offers a full four-year shelf life, and will be just as effective years from now as it is today. Two highly concentrated pepper solution charges give you a second shot. But a single hit to the face from PBII will disable an attacker for up to 45 minutes. While your attacker struggles with nausea, coughing and temporary blindness, you are free to move away to safety. If you have any questions about this product by Kimber Pepperblaster II, contact us by completing and submitting the form below. If you are looking for a specif part number, please include it with your message.